Our Q-Review lecture capture system has really picked up momentum over the last few months, as more and more lecturers are braving the new phenomenon to record their lessons and make it available to their students. Students are embracing this progression of learning and especially like the fact that they can rewind and replay the lecture at their own pace. One student commented that a revision lecture capture was “the most useful and informative revision materials that [he] had ever recieved [sic]“. Many students remarked that they wish more teachers would use this facility. While some lecturers record a live lecture or event, others use the technology to record their lesson(s) without an audience. This seems to be a good starting point for lecturers, and gets them used to the idea of being recorded and more familiar with the process. Dr. Eram Rizvi, from the Physics department, did just that when he came to our E-Learning Studio and recorded a revision lesson for his students, using material that he had covered in a previous live class. He wanted to record the already taught lesson so that his students could review the content at their own pace. We asked Dr. Rizvi to share his experience with us, and below is an excerpt of Dr. Rizvi’s interview, followed by some noteworthy feedback from his students. ELU: Have you previously recorded a lecture? ELU: How did you prepare to use the system? Did you need training? ELU: What did you record? ELU: How long did you spend recording? Dr. Rizvi: The total lecture time was about 2 hrs, I needed an extra hour initially to learn the system from you, and I needed another 30mins in total to do the final edit for the first lecture, but the edit for the second lecture then took only 2 mins. ELU: What did you think of the Q-Review system? Was it easy to use? Dr. Rizvi: For recording the system is very easy to use. For editing the software can be improved. One difficulty I had was in using the time-slider to find a specific moment in the video to edit out. It would be better if I could use the slider in 1s intervals, or insert an exact time into a text-box. ELU: How did you make your recordings available to your students? Dr. Rizvi: I made available the audio only and video podcasts as downloads plus links to the Q-Review page for the enhanced video with slides. The powerpoint slides were also provided as a separate PDF file. ELU: What did your students think of it? Have they been able to access it? Dr. Rizvi: Most students used it and all thought it was a very good idea and would recommend its wider usage. The real benefit was in being able to replay sections of the podcast and to go at their own pace. Two students mentioned that the podcasts are good for reviewing concepts, but not good for going through detailed mathematics where 1-2-1 teaching is more appropriate. ELU: Would you use Q-Review again? ELU: Would you recommend Q-Review to others? Dr. Rizvi: I already have done. I have asked this be raised at the next Teaching Committee meeting in the Physics department. 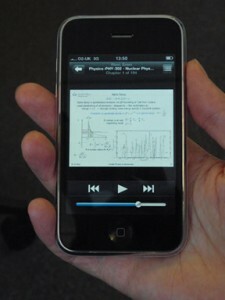 Dr. Rizvi: Yes, I would use it to record a live lecture to provide additional revision material before the exam period. I would not make the videos immediately available for fear of students not attending. Dr. Rizvi shared some feedback from his students regarding the usage of podcasts for revision lectures. He initially asked students if they wanted to have podcasts. He got 16 responses, of which 13 wanted the podcast as opposed to an actual revision lecture.